Night gathered, and our Watch began, yet through the years, The Watch has grown to be a shadow of itself. The Realm, our sacred charge, was still falling apart, and with it, our guild. No more were we standing strong in the face of adversity. No more did we light the darkness, or shield the realms of men. Night gathered, and we fell. In light of the recent events, or lack thereof, in the guild, and in light of the loss of many brilliant officers and members of The Night's Watch, it stirred the Council from our apathy. Clearly, the systems that held the guild together were failing to do so. We deliberated for some time, looking for ways to renovate the guild, streamline the systems, and work towards a better, more fun experience. We'd like to think we've succeeded at this, with The Fifth Restructure. The Rules of the Watch have been streamlined, allowing for more leniency and interpretation. We still don't allow banditting, but we're more open to the idea that certain areas within the realm are inherently more dangerous. Membership and Promotion progress has been made more simple, with fewer ranks and more straightforward requirements for each rank. Voting will now take place at different levels than just the Council, depending on the proposal. Changes that affect more critical aspects of the guild may be brought down to lower levels of ranks, so that members will have more say in the way things are run. For more information, please read the linked document, by clicking here. This information will also be distributed in the Discord, which will be undergoing a few changes to accommodate the Restructure. Thank you for your time, and may these changes bring about a new and brighter future for not only the guild, but the Realm. Please be aware that the time and date attached to the email for the George Romero Memorial Procession were incorrect due to a bug in the Night's Watch system. The event page has been updated with the correct date, time, and location. I am pleased to announce that The Night's Watch and the Dawn Brigade have come together and signed a Treaty of Mutual Cooperation. Your first thought may be - "But Commander, we don't participate in the politics of the realm!". That's right, Private - we certainly don't - and we're not going to start now. We have agreed to work together on events, exchange mutually beneficial knowledge, and other finer points. PREAMBLE. The Objective of the Treaty being the operational benefit of the two equal Parties. Both Parties hereby obligate themselves to share useful in-game intelligence and refrain from harming or impeding one another in any way, in-game as well as in any and every other context. ARTICLE I. LEADERSHIP. In each Party, the highest-ranking member present is, at that point in time, that Party’s leader. In the case of joint events between Parties, the leader of the leading Party is transitively the co-operational general commander. ARTICLE II. MEMBERSHIP. Both Parties agree to disclose whatever information about its membership may be useful to the joint operation whenever convenient or necessary. Neither Party is obligated to disclose any specific information about membership. ARTICLE III. ATTENDANCE. Both Parties agree to work together to coordinate their events in a manner such that, whenever possible, members from the other Party are able to attend. A liaison for each Party shall be appointed at a later date by mutual agreement of both Parties to better facilitate this endeavor. ARTICLE IV. RATIFICATION. This Treaty will be ratified by Dawn Brigade and The Night’s Watch in accordance with their respective ratification processes and will come into force when instruments of ratification thereof have been exchanged and agreed upon on Shotbow forums. ARTICLE V. EFFECTIVE: This Treaty will last from its ratification until either party sees fit to terminate it. Any activities before the duration specified that breach the terms and agreements of this treaty are inconsequential to both parties. This Treaty may be terminated by either party with a two (2) day notification. Over the years, the men of the realm have increasingly turned to banditry in order to survive. We hope this treaty with the healing clan, Dawn Brigade, will help mark a move from banditry to helpfulness. This is a cross post from the Shotbow Forums by halowars91. You can also read it there. It has been a long time since I addressed you. I remember when I joined MineZ a couple years ago. I never imagined I would become part of this network, and have the wonderful opportunity to help create so much. Over these three years of building, I have participated in the construction of this beautiful world and the story that grew around it. My predecessors Kensai111 and NicolaLeevey left me with the lore and the map, and I have tried my best to treat the lore carefully and with love. We have slowly whittled away at the rest of the lore, and you now have nearly all the pieces you need. You’re so close, but you still have questions, don’t you? As some of you have guessed, there is another update planned. Some of you may call this, the Endgame. 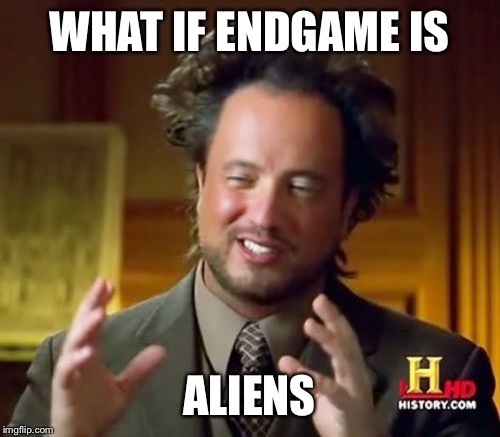 I can confirm this rumor. This update is my most ambitious project lore wise and gameplay wise, utilizing as many features and components as I can, and I’d like you, the players to get involved. What would you like to see in this update? What did you enjoy from the prior updates? What dungeons did you enjoy? What puzzles did you like? Do you have any suggestions? Ultimately, I have always built for the player. You are our inspiration to continuously push the limits on what is possible. We love to watch you attempt the puzzles and immerse yourself in this world. This is for you. With this update I will be completing the story of MineZ and the dungeons of MineZ. 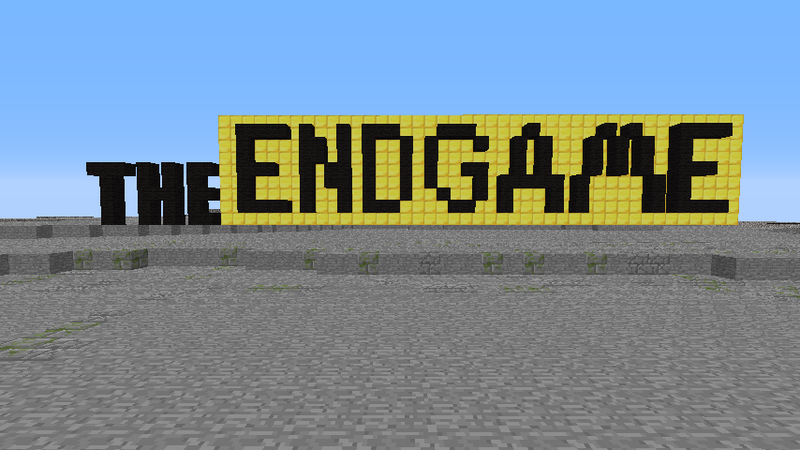 Now, you may be asking yourself, when will this Endgame update be released? There are certain things that must happen before this update will be released. What are they? The Seal holding Dentril must be tampered with. The Library of Axis Mundi, the ancient center of knowledge, must be rediscovered. Those long since put to rest will return in nothing but bone. An Event will shake the world, heralding the imminent uncovering of the location of The Origin. Information previously unknown will be revealed in a location of knowledge. Make sure to post your suggestions and thoughts, in an organized layout. Thank you for trusting me with the world that you hold dear and love. I have truly enjoyed working on it for these past three years. This will be my final update to this wonderful world, before I move onto other mysterious projects. We have received intel that the mysterious dungeons will finally be cracked open and ready for exploration. We have also received intel that there are new, more powerful weapons that are being hidden in these dungeons. These new weapons may yet be our key to stopping the undead meance from continuing its wanton destruction of our realm. On August 15th, the floodgates will open. It is not our job as The Night's Watch to explore, conquer, and learn all there is to learn about these new mysterious dungeons, weapons, and to finally uncover the history of the realm. And we shall execute that responsibility with extreme prejudice. Truly now, does our Watch begin. At the time I post the following as a Night's Watch Website Announcement, the contents of this announcement will take effect, by means of me disassembling the council using my legitimate powers, passing the laws through the announcement, and then re-assembling the council as posted in the announcement. It has been a particularly rough two years for The Watch. The Night's Watch of today is a shadow of it's former Glory - The largest and most well-known guild in all of MineZ. It would be too easy to scapegoat this as caused by the downfall of MineZ 2 after we switched to it, or to blame the council, or the corporals, or anyone. The truth of the matter is that The Night's Watch has not been Lead. Lord Commander sssdl4 was incredibly inactive as The Lord Commander, and his replacement - Lord Commander krabbby, despite having the best interests of the Watch in his heart, simply did not possess the necessary pairing of time and charisma required to lead the Watch in all of it's glory. 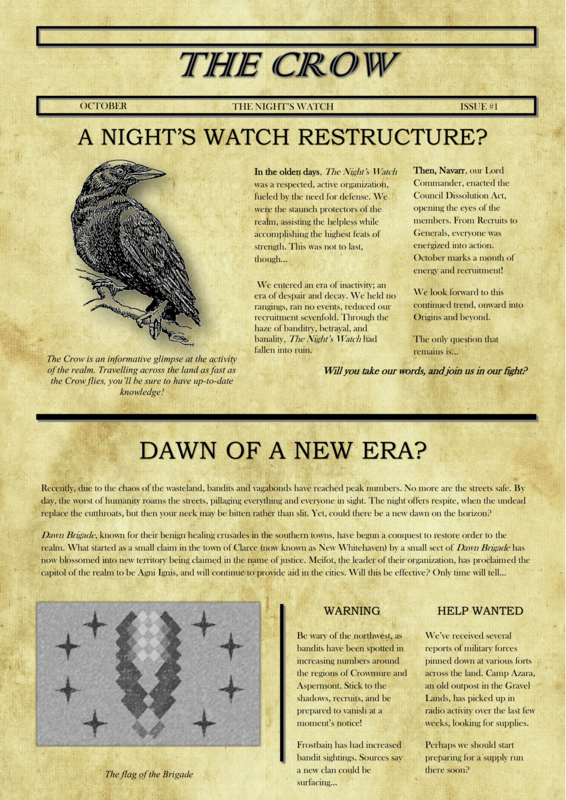 After a lot of deliberation with the council, I am pleased to announce The 2015 Restructure of The Night's Watch! 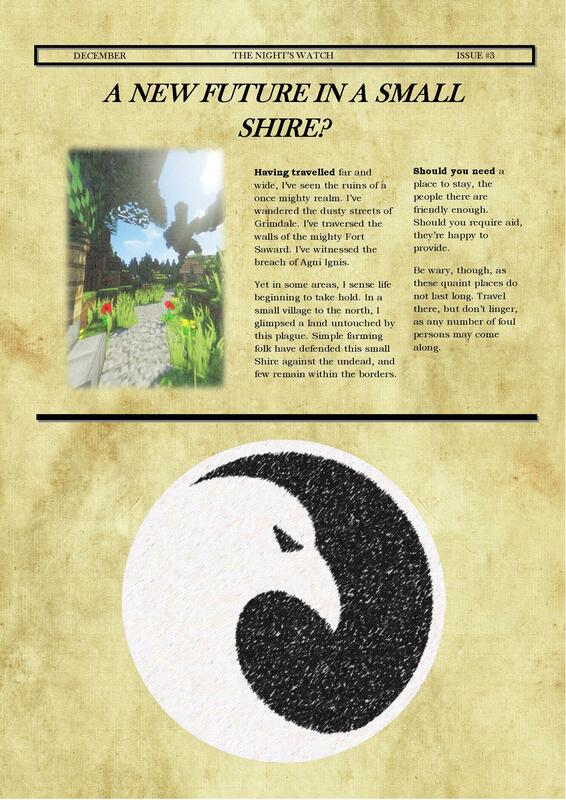 First and foremost is the most important announcement - The Night's Watch is returning to the world of MineZ Classic. MineZ 2 has stalled in it's development and is not giving us the things we need in order to play a fun game (dungeons, mostly). This is important, for reasons I'll address later, as The Night's Watch will be shifting and clarifying it's focus as part of this restructure. If you no longer wish to participate in The Night's Watch in MineZ Classic, you may leave without deserting with the approval of The Lord Commander by messaging him on reddit with your reasons. If pardoned of your duties, you will be kept as a non-member, non-deserter unless you are caught attacking men of the Watch. Secondly, using the powers granted to me by the council, I will be dissolving the council in it's current state entirely - recreating it, and the Watch, with this new structure and rules. Yes, that's right! Lord Commander Navarr is back and he's going to be running this shindig the way he intended! You will notice from this list a complete absence of orders. That is intentional. 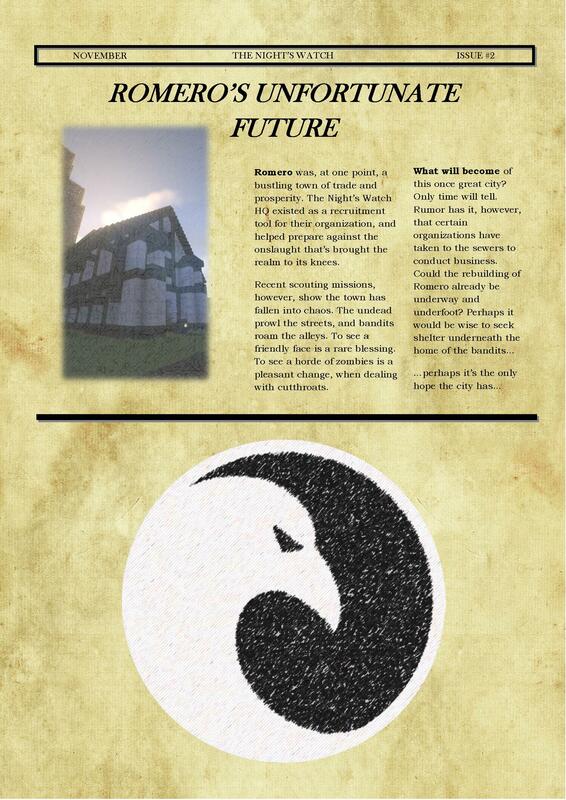 While we maintained the orders set forth by our lore, we will be dissolving the orders entirely. Members of the Watch will be assigned their duties on a per-event basis based on the leader of the event or ranging (with assistance from Night's Watch Officers). Third, Our code of honor will remain as it always has. We are the "good guys" of MineZ. We are here to protect the realm and the people within it. That said, we will shift our focus from being "lawful good" to "neutral good." As stated previously, our code of honor still stands - but with that said: Participation in Yolo Sunday and Suicide Saturday is encouraged - ideally with a team of men from The Night's Watch. When possible, we will have official events for participation in these community run events. These two events are composed of volunteers who have decided to duel - which means they are fair game for men of the watch! Just don't get any innocent civilians involved. Protect them, if you can and want to, but you do not have to. Just do not harm innocent civilians yourself! Our code is sacred. As part of this clarification as focus, we will move from our primary focus being the "good guys" to our primary focus being Dungeon Conquerors. As Majicou's secret update is highly rumored to contain a major overhaul of Dungeons, we will have our work cut out for us. We will have to train, we will have to fight, and we will have to better ourselves and work hard at being the best Guild in MineZ. Our goal is to be known throughout the world of MineZ as the dungeon conquerors. Two weeks are required in order to make sure that a recruit truly wants to be a member of our organization and community, it proves their worth and dedication. However, in addition to that they must demonstrate SKILL in their rangings. While this does not necessarily mean the ranging itself must be successful, it must show that the recruit has the skills necessary for joining the Watch and conquering dungeons. Any recruit that does not possess these skills should be trained by Night's Watch Officers until they meet these requirements. No desiring recruit will be left behind. If that means I, myself, have to spend weekends training with them, then so be it. An "Official Event" is an event run by Night's Watch Officers, involving performing official Night's Watch duties including recruiting, town security, dungeon conquering, and more. An Official Event may only be accompanied by recruits on rare occasions (more informal events, such as our anniversary parties). Ideally, the vast majority of these will be conquering dungeons. We will not want untrained recruits accompanying us during these attempts. A "Ranging" is a training mission of some fashion. The purpose of a ranging is to make sure that a recruit knows what he is doing, and is trained to a level befitting a post in The Watch. Rangings may include Yolo Sunday and Suicide Saturday if the leader of the event can pay enough attention to assess the worth of a recruit. These events may also include dungeon scouting, where a member may show their know-how and ability to navigate a dungeon (with no expectation to beat the dungeon), and training sessions in areas densely populated with Zeds. Rangings may also be held in GG where the leader and the recruit practice various methods of PvP to assess knowledge, skill, and to teach such knowledge and skill. Rangings may not be an attempt on a dungeon. As for hosting a Ranging - Any member Corporal+ may host a ranging at any given time. Any full member of The Night's Watch (Private level) may host a ranging with a quick sign-off from any Lieutenant+ officer of The Night's Watch. Officers of Lieutenant or above are almost always available in the chatroom, and General Krabbby is there most of the time. It should take little to no time at all to gain the approval of an Officer and hold a ranging. It is beneficial, and we request that when holding a ranging you record it. In order of preference: with Miners-Movies, or with video software. Miners-Movies will allow yourself, and the officers reviewing the ranging to assess the skill of the recruit fully. After holding the ranging, in order for the recruits that participated to gain credit for it, you will be required to submit a report to The Night's Watch council. This may be done through reddit modmail to /r/TheNightsWatch or more easily through a work-in-progress system to place a report on an Event through the website. You should report on how the event went as a hole, as well as what skills you noticed the recruit had or lacked so that they may be improved in training sessions and rangings held after yours. Failure to create such reports in a timely manner will lead to demerits, in addition to the recruit unfortunately not obtaining the ranging as a credit towards their requirements. Thank you all very much for reading. I look forward to the revitalization of the Watch to it's former glory, and I look forward to seeing you all in the dungeons. Wow, it's been three years of time since I first started The Night's Watch. It's a lot to look back on and think about. Remember, Recruits and up! The celebration is tomorrow at 5pm US Eastern Time! You don't want to miss it! With what should be a surprise to no one, MineZ 2 has turned out to be a damn good game. It is with that in mind that I'm officially establishing MineZ 2 as the new home of The Night's Watch. This means (as has been true since MineZ 2 started) that your oath applies to the world of MineZ 2. However, this also means that you are no longer bound to your oath within the world of MineZ: Classic. While it is recommended that you carry your watchmanly behavior throughout all games that you play on, you are no longer required to follow your oath nor the rules of engagement in MineZ: Classic. The 3rd Lord Commander, New First Ranger, New Corporals, and more rangings! After a lot of deliberation and discussion, the council of The Night's Watch, in coordination with the 1st Lord Commander Navarr decided to promote the Interim Lord Commander and First Ranger krabbby to the position of Lord Commander, making him the 3rd to hold such a position. krabbby has had his moments, as have we all, but he has served The Night's Watch faithfully, pushed me to do more for the Watch with constant nagging and reminders (that I am very thankful for), and overall has the best idea of where The Night's Watch should continue to go. I believe that with krabbby as the Lord Commander of The Night's Watch, the organization will continue moving in the proper direction to gain members, activity, and achieve it's goal. I also fully believe krabbby to be the best suited person to lead The Night's Watch into MineZ 2. It is with those thoughts that I recommended the council promote krabbby to the position of Lord Commander, as it has done so. The specifics of that vote may be found in it's announcement thread on the subreddit. Replacing Lord Commander krabbby as First Ranger will be (previously) Lieutenant falling_dutchmam. First Ranger falling_dutchmam is also a long standing member of The Night's Watch who has shown his loyalty to the watch, which is why I recommended he replace krabbby and why The Council elected him into the position unanimously. Before his promotion, Lord Commander krabbby also pushed forward a resolution that was unanimously accepted to allow Corporals to lead rangings. We are hoping that with this resolution and the new responsibilities that Corporals are receiving with it that we will spur more activity within The Night's Watch, leading to an active Watch ready for MineZ 2. krabbby will be communicating with the Corporals shortly after this announcement to coordinate efforts and explain the full extend of those responsibilities. These members of the Watch have shown valiant efforts in leadership, communication, activity, and maturity. We hope that they embrace the additional responsibilities given to them and help lead The Night's Watch into a new era of activity and prosperity. With new activity comes a newer strictness, and with the inability to "punish" members for ill, but not desertion-level, behavior we've had to implement a system to deal with it. On that note, we are introducing Reprimands and Accolades. Reprimands will be awarded as punishment for ill-behaviour, not following orders (in a ranging for example), insubordination, or for other reasons. They will be a strike against your name in the eyes of the Watch. While they are permanent, they will not always count against you. The Resolution has laid out ways in which the Council can mark a reprimand as no longer valid. With punishment, however, comes reward. While we have an "honor" system to reward people for going above and beyond for The Night's Watch, we haven't really had a way to honor those that support the Watch without going quite that far. On that note, we are introducing Accolades. These do not cancel out reprimands, but instead mark what one has done for the Watch. The specific details for each of these items can be found in the resolution announcement on reddit. 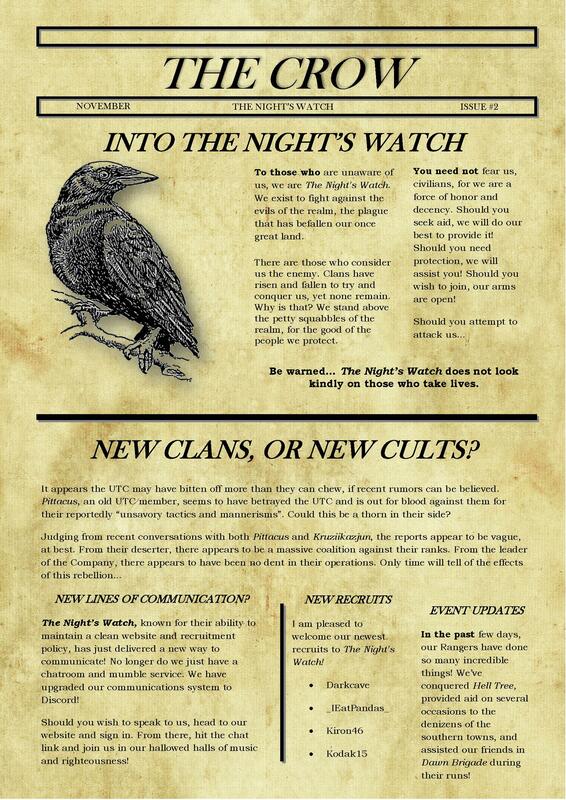 I am honored to usher in this new era of The Night's Watch, and I hope all of you are excited to participate in it. Lore Fanatic? Help with the Direction of Tale of the Robot Wizard! Kensai (you know, the admin?) has been working for a very long time on his game, Tale of the Robot Wizard. This particular game acts as an immediate prequel to the world of MineZ. 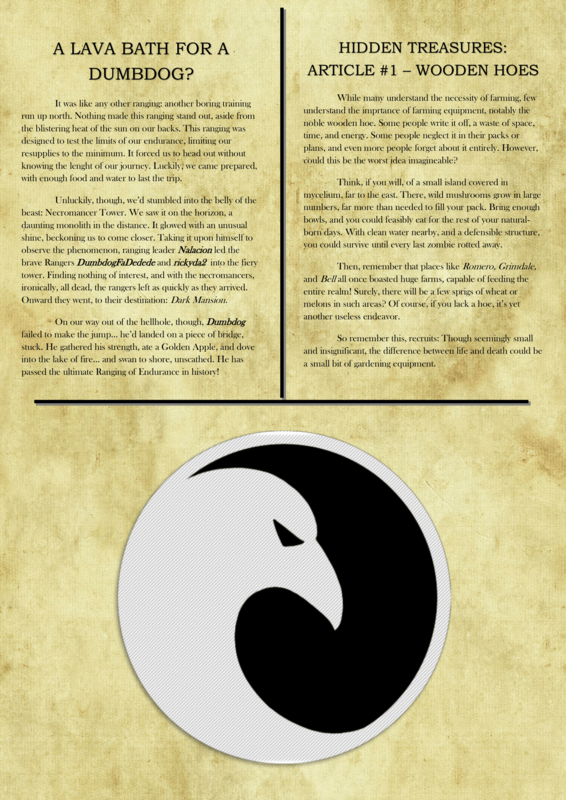 As The Night's Watch has always been a bit more on the roleplay side of things, Kensai has come to the Watch for help and advise on some of the storyline aspects of his game! To participate, head over to his reddit post on our subreddit and contribute away! The council has recently passed a measure that allows YOU! YES YOU! (as long as you are rank Private or above) to write and pass proposals. The council uses proposals sort of like laws. Proposals are how we change the rules of the Watch, but they can also be for things such as events, meetings, etc. The one restriction being placed on them is that members may not post proposals for elevations of rank. A proposal post is made on the Night's Watch subreddit, detailing the intricacies of the proposal, by a Night's Watch member of status Private or above (Council may do this as well, to encourage public discussion). The proposal post is for discussion, and not for voting. The proposal MAY be changed during the discussion. The author of the proposal is required to have a detailed changelog of any changes made to the proposal. The proposal may NOT propose a promotion or demotion of any member of the Watch, nor of any civilian. Council members are HIGHLY ENCOURAGED TO PARTICIPATE IN DISCUSSION DURING THIS TIME. There is a two week period for said proposal to gain a "sponsor" that is not the author of the proposal. For a proposal to enter the next round, a Night's Watch member of Corporal or above must officially declare that they are sponsoring the proposal. The author of the proposal then has 3 days in which to declare the final draft of the proposal, which is then delivered to the sponsor and posted in the proposal thread as a link to a pastebin or github gist. After the delivery of the final draft, the proposal enters a formal voting round by the council. The final votes of this round must be made public. (Who voted and which way). So feel free to start writing your proposals and putting them up on the reddit! 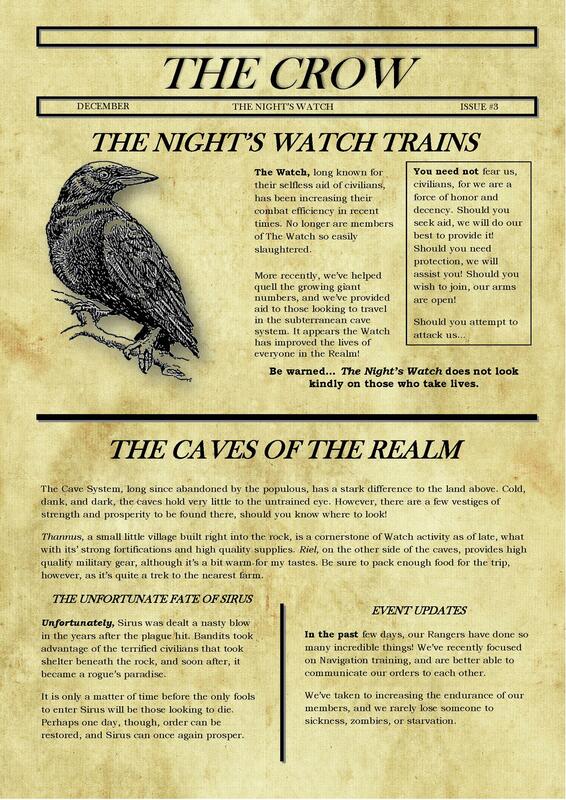 Now you can help contribute to internal Night's Watch politics!